Angela Farris Watkins, PhD, is the niece of Martin Luther King Jr. She is an associate professor of psychology at Spelman College. Watkins is the author of two children’s books about her uncle published by Abrams Books for Young Readers. She lives in Atlanta. Eric Velasquez is the illustrator of numerous books for children. 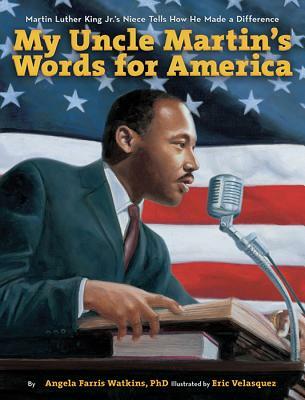 He received the Coretta Scott King/John Steptoe Award and won the Pura Belpré Honor for Illustration. He lives in Hartsdale, New York.